PHILADELPHIA, PA – January 17, 2019 – Janney Montgomery Scott LLC (“Janney”), a leading full-service wealth management, financial services, and investment banking firm headquartered in Philadelphia, PA, announced the hiring of Financial Advisors Chase Bradley, Senior Vice President/Investments and Anthony “Chip” Jessuck Jr., Vice President/Investments to its Mystic, CT branch. Bradley is accompanied by Patty Grady, Senior Registered Private Client Associate. Bradley, Jessuck, and Grady were all formerly affiliated with Wells Fargo. Chase Bradley brings over 30 years of experience to Janney. He graduated from Connecticut College with a B.A. in American History and resides in East Lyme. In his free time, Chase volunteers as a Board Member of East Lyme Little League and East Lyme Babe Ruth, and a Director and Board Member of Southeastern Connecticut Youth Hockey. Anthony “Chip” Jessuck Jr. has over 15 years of experience in the financial services industry. Anthony earned his Bachelor’s Degree in Business Administration at Florida Atlantic University. Anthony is a member of the Waterford Board of Finance and is involved with the Tour de Force Memorial Bike Ride. He also was previously on the board of Waterford Little League and has coached youth sports in Waterford for the past 13 years. 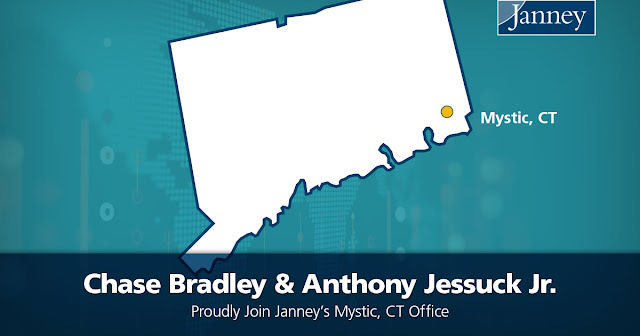 Patty Grady has over 30 years of experience in the financial industry, with prior experience at The Bank of Mystic and A.G. Edwards. Patty graduated from Regis College with a Bachelor of Arts degree in Psychology and resides in Ledyard.